logo-icon-name str r/w/en A named icon to use as the logo for the about box. wrap-license bool r/w/en Whether to wrap the license text. The Gtk.AboutDialog offers a simple way to display information about a program like its logo, name, copyright, website and license. It is also possible to give credits to the authors, documenters, translators and artists who have worked on the program. An about dialog is typically opened when the user selects the About option from the Help menu. All parts of the dialog are optional. About dialogs often contain links and email addresses. Gtk.AboutDialog displays these as clickable links. By default, it calls Gtk.show_uri_on_window() when a user clicks one. The behaviour can be overridden with the Gtk.AboutDialog ::activate-link signal. To specify a person with an email address, use a string like “Edgar Allan Poe <edgar`poe`.com>”. To specify a website with a title, use a string like “GTK+ team http://www.gtk.org”. To make constructing a Gtk.AboutDialog as convenient as possible, you can use the function gtk_show_about_dialog() which constructs and shows a dialog and keeps it around so that it can be shown again. It is also possible to show a Gtk.AboutDialog like any other Gtk.Dialog, e.g. using Gtk.Dialog.run(). In this case, you might need to know that the “Close” button returns the Gtk.ResponseType.CANCEL response id. A None-terminated string array containing the artists. The array is owned by the about dialog and must not be modified. A None-terminated string array containing the authors. The array is owned by the about dialog and must not be modified. The comments. The string is owned by the about dialog and must not be modified. The copyright string. The string is owned by the about dialog and must not be modified. A None-terminated string array containing the documenters. The array is owned by the about dialog and must not be modified. The license information. The string is owned by the about dialog and must not be modified. the pixbuf displayed as logo. The pixbuf is owned by the about dialog. If you want to keep a reference to it, you have to call GObject.Object.ref() on it. the icon name displayed as logo. The string is owned by the dialog. If you want to keep a reference to it, you have to call GLib.strdup() on it. The program name. The string is owned by the about dialog and must not be modified. The translator credits string. The string is owned by the about dialog and must not be modified. The version string. The string is owned by the about dialog and must not be modified. The website URL. The string is owned by the about dialog and must not be modified. The label used for the website link. The string is owned by the about dialog and must not be modified. Returns whether the license text in self is automatically wrapped. Sets the license information to be displayed in the secondary license dialog. If license is None, the license button is hidden. Sets the license of the application showing the self dialog from a list of known licenses. This function overrides the license set using Gtk.AboutDialog.set_license(). Sets the pixbuf to be displayed as logo in the about dialog. If it is None, the default window icon set with Gtk.Window.set_default_icon() will be used. Sets the name to display in the about dialog. If this is not set, it defaults to GLib.get_application_name(). It is a good idea to use the customary msgid “translator-credits” for this purpose, since translators will already know the purpose of that msgid, and since Gtk.AboutDialog will detect if “translator-credits” is untranslated and hide the tab. Sets whether the license text in self is automatically wrapped. The people who contributed artwork to the program, as a None-terminated array of strings. Each string may contain email addresses and URLs, which will be displayed as links, see the introduction for more details. The authors of the program, as a None-terminated array of strings. Each string may contain email addresses and URLs, which will be displayed as links, see the introduction for more details. The people documenting the program, as a None-terminated array of strings. Each string may contain email addresses and URLs, which will be displayed as links, see the introduction for more details. The license of the program. This string is displayed in a text view in a secondary dialog, therefore it is fine to use a long multi-paragraph text. Note that the text is only wrapped in the text view if the “wrap-license” property is set to True; otherwise the text itself must contain the intended linebreaks. When setting this property to a non-None value, the Gtk.AboutDialog :license-type property is set to Gtk.License.CUSTOM as a side effect. 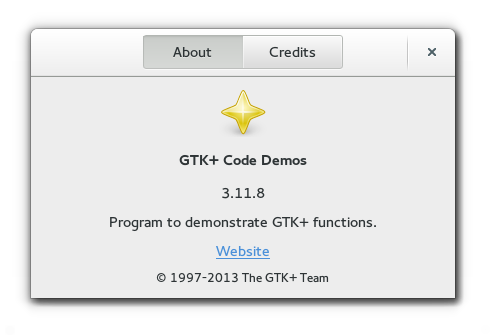 The license of the program, as a value of the Gtk.License enumeration. The Gtk.AboutDialog will automatically fill out a standard disclaimer and link the user to the appropriate online resource for the license text. If Gtk.License.UNKNOWN is used, the link used will be the same specified in the Gtk.AboutDialog :website property. If Gtk.License.CUSTOM is used, the current contents of the Gtk.AboutDialog :license property are used. For any other Gtk.License value, the contents of the Gtk.AboutDialog :license property are also set by this property as a side effect. A logo for the about box. If it is None, the default window icon set with Gtk.Window.set_default_icon() will be used. A named icon to use as the logo for the about box. This property overrides the Gtk.AboutDialog :logo property. The name of the program. If this is not set, it defaults to GLib.get_application_name(). The URL for the link to the website of the program. This should be a string starting with “http://.